This week, Rachel Dacus writes in from the Bay Area, giving Poetry & Popular Culture a little bit of history to, uh, chew on for a while: poetry gumball machines once distributed across eight states by the innovative Portland-based publishing operation Gumball Poetry. 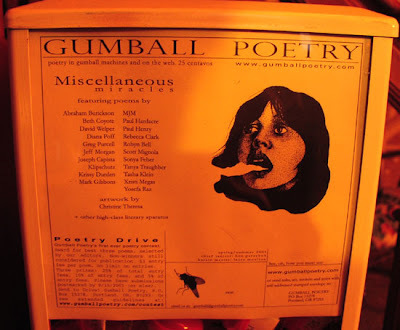 For a while, somewhere between 2004 and 2006, it seems, you could get your hands on a poetry gumball machine stuffed with the work of ten or so poets for as little as $300 each (plus extra for the stand). Here, Dacus takes a moment to reflect on what was—and what could have been. Poetry in unlikely places is one of my favorite things (which makes P&PC one of my favorite blogs, of course), and I'm writing to share an example. On my bookshelf sits a row of plastic capsules that were part of a really original poetry-publishing experiment—the poetry gumball. Instead of finding a Bazooka Joe bubble gum comic inside each capsule, you get chewable gum and a short poem. A real poem. But Bazooka didn't launch or even adopt this project. I mean, pick the two most incompatible cultural artifacts you can think of, and poetry and chewing gum might be there at the top of the list. But Gumball Poetry didn't see it that way, and neither did I. When I first heard of the gumball poetry-delivery mechanism, I thought, I just have to have my poem combined with my favorite childhood chew-toy: my very own Bazooka Joe Brodsky. That was the grand plan, at least, and I could hardly stand the excitement. But then I discovered that the culturally chic Bay Area didn't boast a single Gumball Poetry machine. To buy poems and gum, I'd have to take my fifty cents—my two quartets?—all the way to Portland where Gumball poetry was making its grand offer: "Would you like a Gumball Poetry Machine in your cafe, bar, dance hall, office, hospital, library, school, bathroom, art gallery, clothing store, car, community center, life, church?" The one that really intrigued me was the church—it really rang my bell. All the quarters go into the coffers. The pearly whites meet the pearly gates. Saint Peter meets David St. John. But, alas, Gumball Poetry is no more. The website remains open—now an artifact of a really cool cultural concept—and if you go there you find this note: "This is all just here for historical purposes. In case any of our memories go. Gumball Poetry is on hiatus (likely permanent). We miss you too. It was the best fun we ever had." Looks like even popular poetry's bubble can burst. 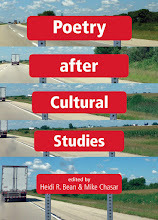 Rachel Dacus' poetry books are Another Circle of Delight, Femme au chapeau, and Earth Lessons. She blogs at Rocket Kids.